Why Do Cats Paw Under Bathroom Doors? As a cat parent, you are more likely than not familiar with seeing your cat’s furry paws under the door when in the bathroom. Considering cats use their paws for many things from familiarizing themselves with a bowl of water to playing with small toys or prey, it’s not surprising they’re using their paws, but why do they do it? And why do they do so when you’re in the bathroom, of all places? Cats use their paws to reach for things they know they can’t have, or things or places that are off-limits. This is due to an unmet need for attention, even if that unmet need goes for five short seconds. Pawing under the bathroom door is your cat’s need for attention, particularly if she is an affectionate cat. Other times, cats see a closed door as an obstruction, which can cause them to become distressed or agitated. If your cat typically has no limits to where he can wander within the home, a suddenly shut-off space can feel like a challenge, which can be upsetting. Cats use their sensitive paws to better understand the world around them. Because your cat clearly can’t see what’s on the other side of the door, she might offer a paw to try to check things out. In a home with a cat, there are no doors that are off limits, but there’s one in particular that tends to attract the most paws: the bathroom door. But why? There a number of things on the other side of that door that your feline friend would love to get to, especially now that they are coveted and just out of reach. Playful cats may enjoy spending time in the bathroom for all of the play opportunities that one can provide, like a tub to crawl in, a sink to sleep in, or a set of hanging towels to rip down off of the wall. Contrary to popular belief, some cats enjoy water, especially a dripping faucet they can drink from or play in, or a wet tub to lick at or dip their feet into. Many cats also appreciate the small confines of a bathroom because ignoring them inside one is easier said than done. Because we only go into the bathroom to accomplish something, be it brushing our teeth or using the toilet, we become committed to the area until we’ve completed the task at hand, which creates prime conditions for cats to solicit affection. How can I make her stop? 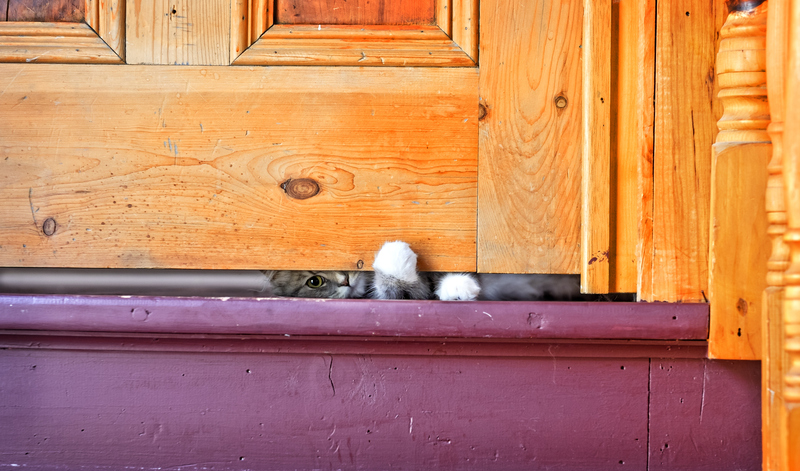 While the occasional playful paw under the door is usually nothing to be concerned about, some cats can take their reaching antics too far, and can sometimes resort to yowling, or scratching and damaging doors. To get your cat to stop doing any of these things, just ignore your cat, and don’t give in by opening the door every time she reaches a foot under one. If you open the door, you’re essentially teaching her to associate the placement of her paw with a reward (the open door.) It’s suggested that you stick to your guns and don’t give in, assuming that there isn’t anything on the other side of the door she may need to reach, like a litter box or water bowl. If your cat is making it impossible to ignore her by crying loudly or damaging the door, try meeting her needs before the door closes. For example, say she won’t let you sleep at bedtime. She may be bored or anxious, so a good round of playtime may tire her out and buy you a restful sleep. If you keep her food on the other side of a closed door she’s reaching under, move the food to a different area, and keep feed times on a schedule so she’ll know when to expect her next meal. You can also try leaving her favorite toys by the door, or offer another treat that will serve as a distraction. Want to learn more about your pup? Check out Why Is My Cat Obsessed With Water?, Why Does My Cat Follow Me To The Bathroom?, and Why Does My Cat Put Her Paws on My Face? at Cuteness.com! 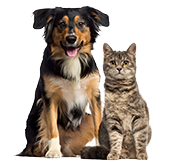 This article is provided by Cuteness—the go to destination for passionate pet parents. Cuteness has answers to all of your health, training, and behavior questions – as well as the cutest, funniest, and most inspiring pet stories from all over the world.